As many of you might remember, ThermoSpas recently donated a hot tub to the Starlight Children’s Foundation of New England for a young boy suffering from cerebral palsy. This small act of good will made all of us here at ThermoSpas feel wonderful. Then we started to ask ourselves, why can’t we make more wishes come true? So in the spirit of the season, ThermoSpas is prepared to donate a limited number of hot tubs to those who need them most. And who knows best? Our customers. If you know of anyone who might benefit from a hot tub of their own, and cannot acquire one, let us know. Send us their name, address, and phone number, and a short explanation of why you feel they deserve a ThermoSpas. Then throughout the year, ThermoSpas will read through all of the nominations and determine the select number who are most deserving of a hot tub. Through the cooperation and generous donations of ThermoSpas, Priority Electric and the Starlight Children’s Foundation of New England, Eric — an 8 year-old second grader from Grafton, MA who suffers from cerebral palsy (CP) — had his wish granted just in time for summer. The Starlight Children’s Foundation of New England is a non-profit organization dedicated to improving the quality of life for seriously ill children and their families. 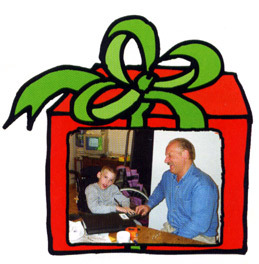 The Foundation grants wishes to children with chronic health problems and wanted to offer Eric, who has suffered from CP since he was born prematurely, the chance to make his dream come true. When Starlight approached Eric and his family about granting his once-in-a- lifetime wish, Eric had a big decision to make. A huge Disney fan, Eric first mentioned that he would love the chance to hang out watching movies at the Disney Store for hours. Another wish idea he tossed around was to ride in an elevator in a tall building for a day. Yet, much to his parent’s relief, Eric — who is confined to a wheelchair – decided he really wanted the freedom and relaxation he got from a hotel hot tub, but in his own backyard. 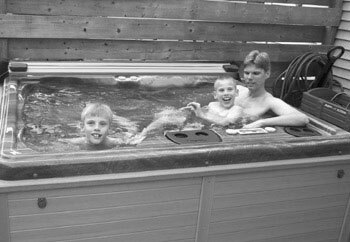 After being contacted by the Starlight Children’s Foundation of New England about this bright, fun kid, ThermoSpas quickly decided to donate and install an Avalon Spa, which is big enough to fit the whole family, yet still fit in their backyard. It comes with 22 jets for therapy and an ice bucket and shelf for drinks. Priority Electric stepped in and donated the electrical hookup. Eric calls his hot tub, appropriately enough, a “Cinderella Pool.” The name comes from his great fondness for the “stepsister-turned-princess.” Yet, the selection also& shows the uncanny similarity between Eric and the fairy tale character who, through& the kind granting of a wish, is able to see her dreams come true and her life change for the better. Not only does a hot tub provide Eric with a chance to move and play freely on his own, but it also offers proven therapy. Eric’s doctor, Christopher Stille, MD of UMASS Memorial Health Care, says the benefits of hydrotherapy (water therapy) include Muscle relaxation, which can reduce muscle spasms in children with spastic CP, Decreased gravity, which increases breath control, Improved trunk control, balance and coordination, Increased mobility and range of motion for children who are wheelchair-bound, Increased strength and endurance. Eric lives with his parents, Cynthia and Richard, his twin brother Aaron, and his adopted brother Anthony. Aaron, like Eric, was born prematurely and has had some severe health problems including a now-removed tracheostomy. Eric’s brother Anthony also has cerebral palsy and is confined to a wheelchair.